Love them or hate them, there are instances where a stripping basket is as essential as your fly rod. If you are a saltwater exponent, where management of 70 or 80 feet of flyline is critical, they are invaluable. Whether you will be wading an estuary, standing knee deep in the surf, fishing off the stones or just walking the shore watching for an opportunity to present itself, never leave home without one. Many of the commercially available baskets, while having some good design features, are let down by equally bad shortcomings. Whatever design you finally decide on, practice or use it on a regular basis and become familiar with its use. Use it once and you will quickly decide it is not for you. The original home made stripping basket made use of a plastic 20 litre box however the ones now available are brittle and crack very easily. After some research, the following design has been trialled both here in Australia and overseas and has proved to fulfil all requirements and it’s still cheap to produce. It can be quickly taken apart and is ideal for storing reels to prevent damage when travelling. 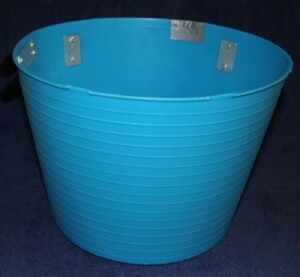 Plastic bucket with handles – can be found in hardware stores and most cheap shops but some are made of a thinner material than others. Try and locate one made of a thicker material. 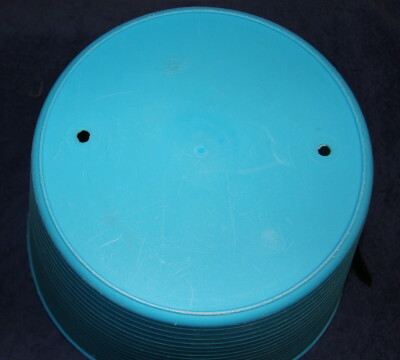 The bucket size used is 32cm diameter across top and 23cm high. 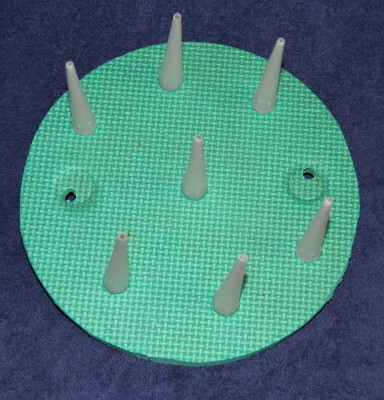 Step 2 – use a hole saw and drill 3 holes about 3cm up the side of what will be the back of the basket for drainage. These will eventually be on the side closest to your body. 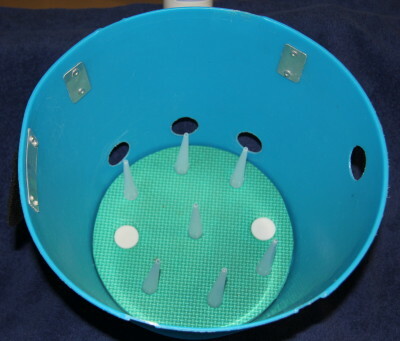 If water gets in, this allows you grasp the front of the basket and tilt it towards you to drain any water out quickly. Step 3 – Make the two attachment points by pop rivetting 2 small stainless saddles spaced about 20cm apart and 2-3cm down from the top of the bucket. 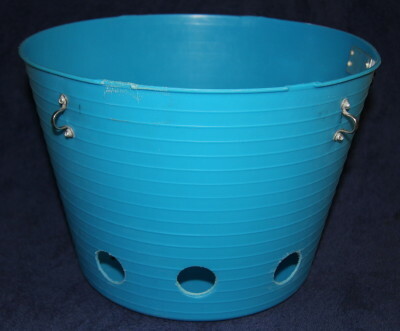 Alternatively, the cheapest way is to drill two holes and make a loop by knotting each end of some stiff cord on the inside of the bucket. 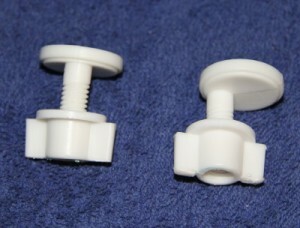 These are the attachment points for the belt straps that position the basket below waist level to enable long strips. 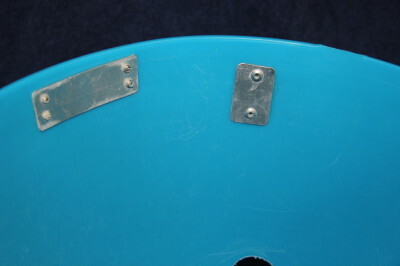 Note – if using pop rivets use some thin aluminium as reinforcement to prevent the heads of the pop rivets pulling through the plastic. Step 4 – The secret of any basket design is to have some sort of retaining clip for the flyline coming from the reel. If you don’t have one, the action of casting will pull the line on the bottom of the basket causing the line on top to tangle. I think this is the main reason a lot of people find baskets troublesome. The clip will also stop the line spilling out of the basket in strong wind or as you move around. It was found the best system is comprised of hook and loop velcro attached to the side of the basket. Position it on the front end of the basket with the opening facing out away from you. 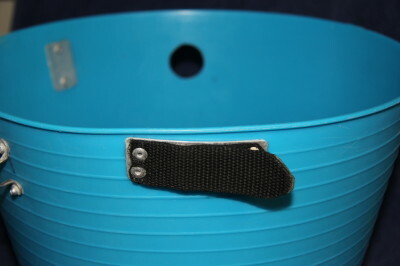 One piece (about 2-3 inches long) with hooks is attached to the side of the basket (pop rivet in each corner). Stick the other piece with loops on a piece of flexible plastic and attach on top by one end at the rear with a pop rivet in each corner. The system allows the line to be pulled clear as the fish take up the slack line. Step 5 – drill 2 x 9mm holes in the bottom that are large enough to thread the foam bottom retainers through. These are the plastic screws that are used on toilet seats and can be bought at hardware stores. Step 6 – Cut a piece of solid closed cell foam(camping mats are ideal) to fit neatly into the bottom of the bucket. 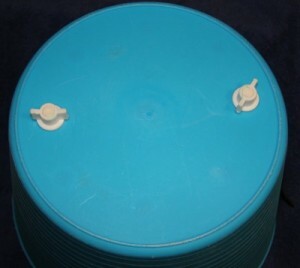 Step 7 – Place it in the bucket and drill holes for the retainer screws. 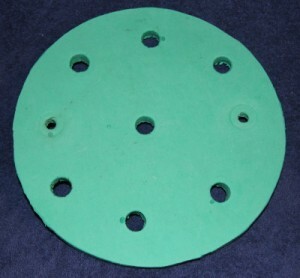 Mark the position for the silicon nozzles and drill holes in the foam. Basket assembled ready for use. Step 8 – The basket is hung from two cord loops that are knotted on the top so that they can slide around the belt. This allows the basket to be positioned to suit individual preference for position. The loops lower the basket below waist level to allow long single handed strips when positioned on the side or double handed strips when positioned on the front. This avoids the uncomfortable necessity of holding the rod high to strip as you have to do with many of the commercial baskets that are worn about waist high. The lower ends of the cord loops are fitted with clips that connect to attachment points on the side of the basket. The basket can be unclipped or swung around out of the way when fighting a fish. More importantly, you can sit down in a boat with the basket on and still be ready to make a quick cast if an opportunity presents itself. As a rough guide when making the loops measure the length so that top of the basket is positioned at the top of your thigh. Test the position and adjust to suit yourself.